Next week I will report on August figures for Gig Harbor home sales which appear to be an improvement over July’s anemic closings. We are set to close on target or better than 2009, with pending sales starting to flow as well. Sales include a couple more closings over 1m. Often Gig Harbor home sales do not follow county or regional trends. While July figures were down throughout the region and Gig Harbor, inventory did not build in Gig Harbor as in other areas. Washington State–specifically Tacoma and Bremerton-Silverdale–are poised to have some of the strongest housing markets by 2014. Earlier this month Businessweek.com released a forecast of the U. S housing market, prepared by Moody’s Economy.com and the information firm Fiserv. Bremerton-Silverdale housing prices are expected to increase 44.7% over the next four years or 9.7% annually. The area has experienced a 20% drop from the 2007 boom year. The area’s heavy military presence has kept unemployment at 7.2%, compared to 9.5% nationally, and only a fraction higher than last year. Median family income is $69,900. The area attracts buyers looking to live close to Seattle at a lower cost in a great natural setting. The same thing can be said of Tacoma, which the study predicts will be Washington’s second strongest market with a 33.1% price gain. 15% of that is predicted to occur by 1st quarter 2012. Tacoma’s median family income is a tad lower than Bremerton at $66,200. Gig Harbor is blessed to be straddling these two metro areas, offering some of the best schools, great parks and recreation, panoramic views, proximity to Seattle and probably the most picturesque small waterfront city in the Northwest. Housing supply and demand in Washington, Oregon, New Mexico and Utah are in balance, according to the research, and are most likely to be undersupplied in another two years. 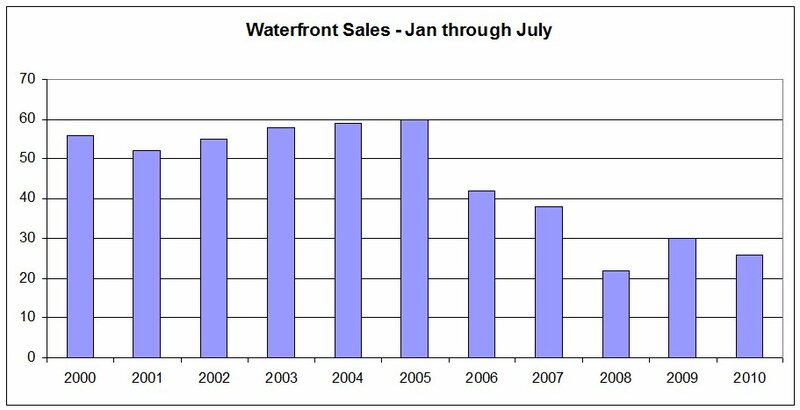 With 10 Gig Harbor waterfront sales written in July, the year is shaping up to look not as good as 2009 but not as bad as 2008—which was the worst for sales of Gig Harbor waterfront homes for decades. Only 26 homes have closed escrow in 2010 through July. Nine of those were in June which gave waterfront Brokers signs of encouragement. But July turned around and brought only five closings. Closed sales numbered 30 at this point in 2009, with 51 sales, and 22 in 2008 when the year finished with only 40 sales. 101 sales is the average yearly number from 1998 through 2005 (just prior to the market peak when sellers “hung on” to their homes with expectations they would continue to increase in value). This number was consistent even during the recessionary early years of this decade. So 40 sales of Gig Harbor waterfront homes is abnormally low. And in 2009 when many of the high-end sales were cash, because of non-existent jumbo financing–sales barely topped 50. Three of the July closings have been listed for 1578 days, 700 days and 537 days, respectively. Nearly half of the current inventory of Gig Harbor waterfront homes is listed over $1,000,000. The median price is $625,000 in Key Peninsula. Normally Key Peninsula attributes one-third of all sales. This year their share is closer to one-fifth of sales. Additionally, there is a fair amount of “shadow inventory”. These are sellers who would list their homes if the inventory wasn’t already so high…or those who have become discouraged and taken their homes off the market for a period of time. These “pent-up sellers” create something we call “shadow inventory” and they will enter the market once sales activity improves, thereby applying downward pressure on prices. In my weekly snapshot of Gig Harbor waterfront market conditions that I prepare for my sellers and it is notable that four to six sellers have reduced their prices each week since the first of the year. Carole Holmaas is a Broker, specializing in Gig Harbor Waterfront sales, at Windermere Real Estate, licensed since 1968. She may be reached at 253.549.6611 or Carole @ISellGigHarbor.com.